What most Americans don't realize is that dependence on foreign oil isn't the main obstacle to US energy autonomy. If you think America's energy supply issues begin and end with the Middle East, think again. One of the most critical sources of foreign energy is due to dry up this year, and the results could mean spiking electricity prices across the country. In 2011, the US used 4,128 billion kilowatt hours (kWh) of electricity. Nuclear power provided 790.2 billion kWh, or 19% of the total electrical output in the US. Few people know that one in five US households is powered by nuclear energy, and that the price of that nuclear power has been artificially stabilized. Unfortunately for us, the vast majority of the fuel used for powering our homes must be imported. 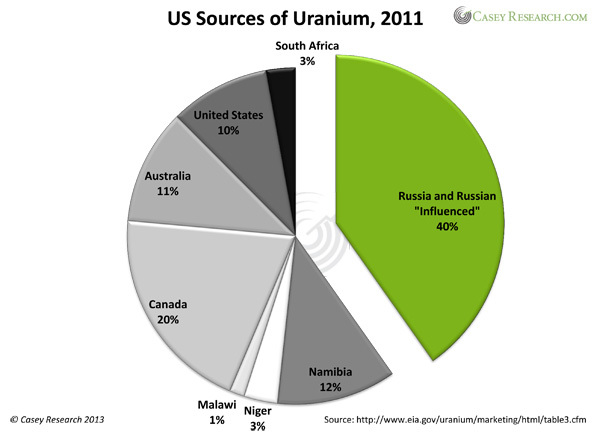 The overwhelming majority of that Russian uranium comes from a 20-year-old agreement called “Megatons to Megawatts” that allows weapons-grade, highly enriched uranium (HEU) to be converted to reactor-grade, low-enriched uranium (LEU). By December 2012, “Megatons to Megawatts” had produced 13,603 metric tons of LEU for US consumption and provided the fuel for nearly half of the US electricity generated from nuclear power. In December 2013, that agreement expires, and Russia will be free to put its uranium out on the open market and demand higher prices. With 17 nuclear reactors in China and 20 in India – not to mention Japan, France, Germany, and others all vying for nuclear fuel – competitive bids are poised to drive prices higher, and early investors stand to make spectacular gains. If this information is news to you, you are not alone. While the mainstream media focus on the US's “Middle Eastern energy dependence,” the real story remains unnoticed. That's why Casey Research invited the field's top experts – including former US Secretary of Energy Spencer Abraham and Chairman Emeritus of the UK Atomic Energy Authority Lady Barbara Judge – for a frank discussion of what we think is America's greatest energy challenge. Join us on Tuesday, May 21 at 2 p.m. EDT for the premiere of The Myth of American Energy Independence: Is Nuclear the Ultimate Contrarian Investment? to learn how the end of “Megatons to “Megawatts” will affect the US energy sector and how you can position yourself for outsized profits. Attendance is free – click here to register.